The days are short lately. I love little lamps and twinkle lights. It just feels so much cozier. Don't you think? computer with all the gorgeous home tours going on? I also agree. It is fun to see all the home tours. I love your twinkle lights, too. Have a good holiday! No, you are NOT the only one...I have been mesmerized, and of course getting ideas that send me rummaging through my Christmas bins:>) I love all the lights this time of year, it is so gloomy here, the sun hasn't been seen for days! So a few candles, the Christmas lights and anything else that can brighten the house just makes it feel so cozy! You are getting the BEST ornaments! I love the shape and color of these! You're definitely not alone! I rushed through cleaning my house this morning just so I could plop down on the couch with a cup of tea and just gaze at all the lovely blogs out there. LOL! 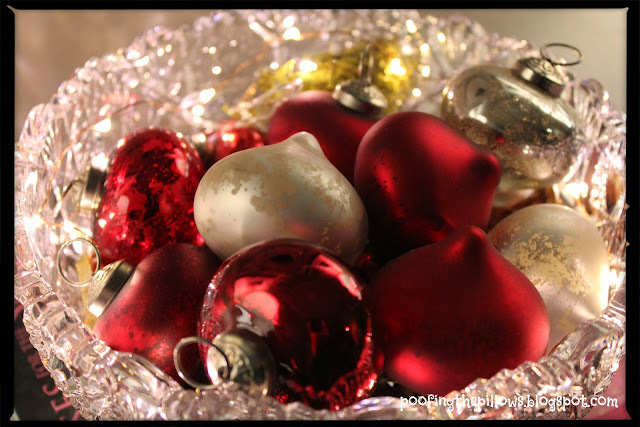 Love your ornaments and that bowl is beautiful! I plan on visiting right after I post this. I need some ideas for decorating our home tomorrow. I am decorating in between reading blogs though! Almost done. I have a thing for twinkling lights, too! Enjoy your day, Stacey! Thank you so much for stopping by, I'm pretty sure I remember that lamp, goes so well where you have it. Oh yes! 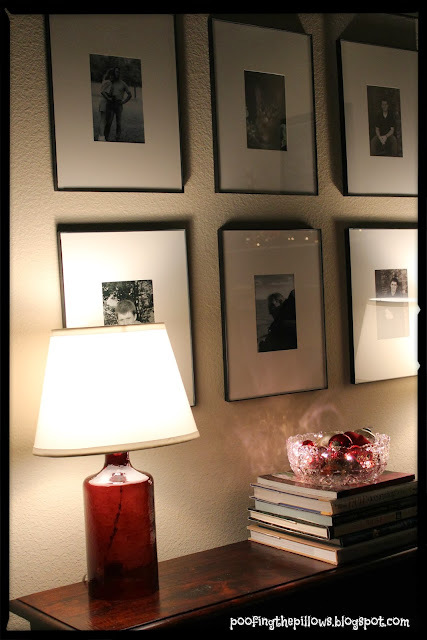 Loving the glow of lamps and the twinkle lights and candles! I love the twinkling lights, too. What a pretty bowl, Stacey! You home looks lovely and very cozy! Enjoy the season! Merry Christmas...I'm off to Florida next week to visit family. Blessing to you and yours! Yes, definitely makes things cozier. Your twinkly lights look so pretty. No, you're definitely not alone in enjoying the Christmas home tours. So much inspiration out there. I am slowly decorating and loving it. 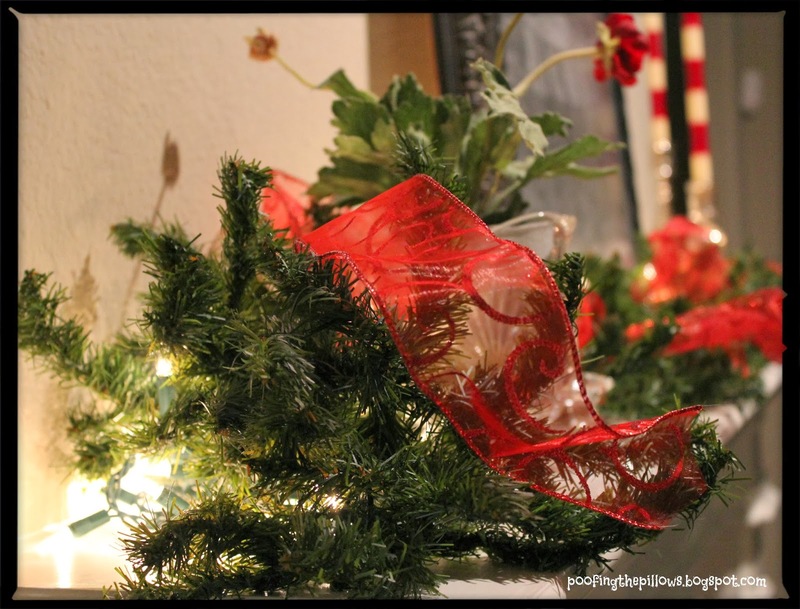 I love the snippets you've shown of your pretty Christmas decor. Your home looks very cozy. It has been dark and dreary almost all week here. It's hard to get good pictures with very little sun shining in the windows. Yes, I'm having trouble getting off the computer too! So much to see in blogland right now. Lots of great ideas. So beautiful!! This is a horrible time for my computer to go out. :( I miss seeing so much! Every home is magazine worthy! I am really enjoying my computer time a little too much lately!! I love twinkle lights, too, and always hate to see them go after Christmas! Looking beautiful, Stacey. Love all the things you're sharing this season. The blog tours are fantastic this year!! I love the soft glow of twinkle lights, too! And you're right...there's so much Christmas inspiration out there!! /Stacey, thank you so much for visiting our home tour and leaving your sweet comment. I know why you love the red and white-it's because you love it, too! I'm loving seeing all the homes decorated for Christmas, too! I agree with you that there are so many wonderful homes with such good decorating ideas, it's hard to find the time to do anything but look! Love your twinkle lights and ribbons. everything looks cheerful. I love all the Christmas tours, too. So much fun seeing all the twinkling lights and pretty greenery. Get's me busy thinking for next year. I love lamps and twinkle lights, too. They are magical.